My Mom-Friday: Family Friday: Who's Valentine? Me: Yes, it's on Friday, but you still have school, it's not a holiday. Boy: Oh, so it's just regular? Who's Valentine? But people are celebrating. Teacher said we'll make a card for you. That was our conversation in the car early this week. And now, here's his jumbo Minion-themed family Valentine's card which he proudly showed me yesterday when I fetched him from school. "Look, it's a pop up card! See?" He said this is for mommy, daddy, and M! =) This boy is the sweetest! Anyways, we don't really celebrate Valentine's Day in the family. After getting married, V-day became less appealing as the years passed. I actually forgot what was the last Valentine gift I received or gave. When the kids learned about this day of hearts in school, it was their turn to "celebrate" it with art projects that they make as gifts for me. 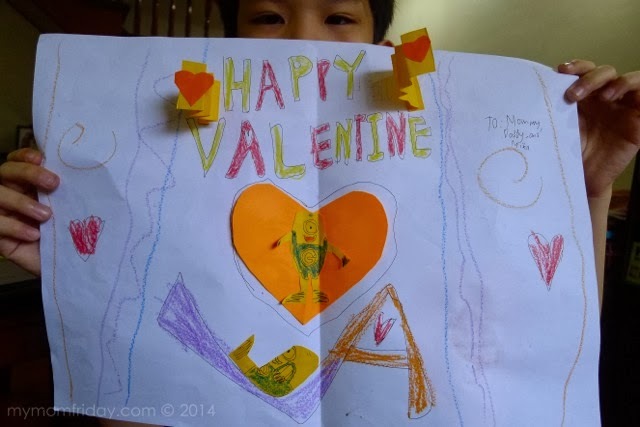 Here's his first Valentine pop-up card for me. For me, Valentine's Day is more special for couples in the courtship stage, and those BF-GF status. Agree? Among my circle of friends, all married, majority never celebrate Valentine's anymore. It's just one of those days. Come to think of it, married people should celebrate it more, just to rekindle those mushy and romantic moments of the early years, or simply to take advantage of this once-a-year occasion to have a spectacular date with you spouse. Kahit once a year lang! =) So, I applaud all the married couples who still make that extra effort to surprise each other, of celebrate in any form during this love month. Valentine's Day = Roses = Chocolates = Dinner Dates = Traffic. So, just stay home. =) Such a scrooge, right?! We never planned anything for today, but last night, J thought we can have breakfast after we bring the kids to school. Ok, breakfast date it is. Better than nothing, hehehehe. I was not able to answer the boy's question about who Valentine is (coz I forgot about it, and I have no time to look him up, hehehehe...) so if you do know, please tell me on the comment section below. Do you have a memorable Valentine's Day? Mine was when I received my engagement ring, 12 years ago. Have a sweet, romantic, and fabulous weekend!